Thumb pain, whether it’s right thumb pain or left thumb pain, is a common symptom of thumb osteoarthritis, also known as basal joint arthritis or CMC arthritis. These simple at home stretches for the thumb and wrist will help ease pain, increase range of motion, and stretch & strengthen to help ease sore, swollen, painful thumbs associated with thumb osteoarthritis. 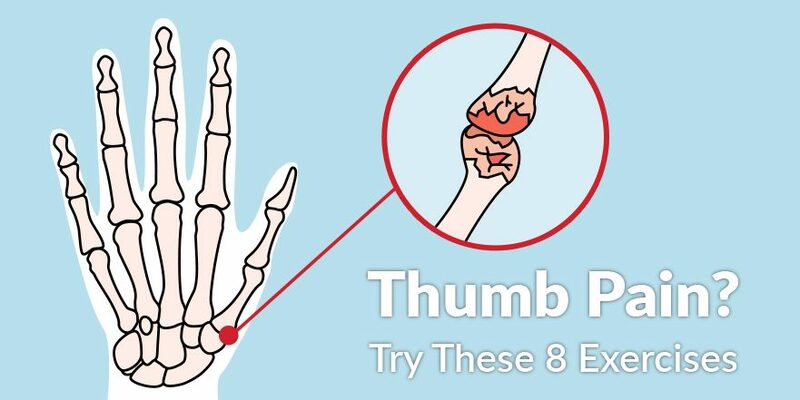 If you have swelling, stiffness and tenderness at the base of your thumb, or have been diagnosed with thumb osteoarthritis, these exercises are for you! If the base of your thumb really hurts, try acupressure as a simple home remedy. Using the thumb and index finger from your opposite hand, apply firm pressure for 30-seconds to the webbing between your thumb and pointer finger. This will stimulate the LI 4 (Large intestine 4) acupressure point known for easing aches and pains. Joint distraction is an easy and effective way to get some relief from sore and swollen thumbs. Take your opposite hand and use it to gently grasp the base of your painful thumb, then gently pull until you feel a slight relief, hold it for 30-seconds and release. This exercise has two parts to help get your wrist moving, do 10 repetitions 3 times a day of each. First, move the hand back and forth as much as possible. Second, move the wrist from side to side as much as you can without straining. These two exercises will help stretch your arm and wrist muscles. Hold your arm out with your palm facing away from you, use your opposite hand to gently press your fingers back, toward you, until you feel a light tension; hold for 30-seconds. Then, point your fingers down and use your opposite hand to gently press your fingers toward you until you feel light tension; hold for 30-seconds. Use a sturdy table to do these two stretches. With your feet firmly planted on the ground, hip distance apart, place your hands on a table, palms down, lean forward on your hands until you feel a gentle stretch and hold it for 30-seconds. Then, place your hands on the table palms up and lean forward again until you feel a gentle stretch in your arms and hold for 30-seconds. This exercise can be done with or without a weight, here we’ve used a hammer to help increase the resistance. Hold the hammer handle closer to get less resistance and further down the handle for more. Holding the hammer, turn your hand from palm up to palm down, twisting at the wrist, do 3 sets of 10. Here we’ve used a can of soup, but you can use a weight if you have one. Holding the can in your hand with your palm facing down bend at the wrist to lift the can up toward you then down toward the floor, do 3 sets of 10. To help strengthen the muscles that help you pinch, grab, grasp or grip objects, hold a ball (a tennis ball will work) squeeze for 3-seconds and release doing 3 sets of 10 repetitions. Thumb pain is a common symptom of thumb osteoarthritis, along with thumb soreness, swelling, less strength when grasping or pinching objects, and less ability to move your thumb. If that sounds like you, physiotherapy can help reduce pain and prevent progression. Find a clinic near you to start getting better today!